Our favorite model in the outgoing 7-Series lineup is the diesel model. 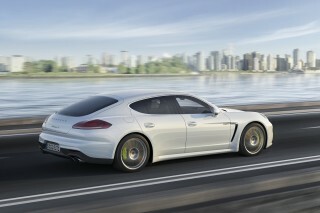 For now, that’s missing from the range, though we’d place our bets on next model year for its return. The BMW 7-Series makes tremendous technological leaps with every generation. And rather than keeping its transcendence to what's under the hood or to technology on the dash, the sixth-generation 2016 BMW 7-Series learns a bit from BMW's carbon-fiber &quot;i&quot; cars underneath and inside. The 2016 7-Series is about the same size as the outgoing car, yet it's built on a new platform and from a combination of ultra-tensile steels, carbon fiber-reinforced plastic, and aluminum. BMW says it's lost 190 pounds. The 7-Series' doors and hood are aluminum, lighter weight suspension components cut unsprung mass, and BMW notes that the 7-Series keeps ideal 50/50 weight distribution. BMW keeps the exterior design of the 7-Series remarkably clean, and it builds on the classic sport-sedan proportions that the brand has reestablished with the current 3-Series and 5-Series models. Just as we've seen in BMW's recently renewed utility vehicles, there's a taller, larger version of the brand's dual-kidney grille that also serves as an air intake-while a lovely sculpted crease rises from the hood to continue subtly all the way to the rear lamps and a chrome accent bar across the rear. A chiseled piece of brightwork starts behind the front wheelwells, where it incorporates an air breather, and continues along the lower side of the vehicle, taking visual weight out of the car's profile. Inside, BMW continues some of the design themes it's already embarked upon with other recent vehicles. The instrument panel gets more shelf-like and horizontal than ever. There's more brightwork here than in the outgoing 7-Series, with a satin-metallic look that also involves the facing for climate and audio controls. Yet the look remains relatively formal. The 2016 BMW 7-Series arrives in the U.S. market in 740i, 750i (both with rear-wheel-drive), and 750i xDrive (all-wheel-drive) forms. The 740i is powered by a 3.0-liter twin-turbo inline-6 making 320 hp, with the 750i packing a 4.4-liter twin-turbo V-8 that produces 445 hp. BMW says that the efficiency of both engines has been increased. In the coming year, a 740e xDrive plug-in hybrid is set to join the 7-Series lineup. It unites a 2.0-liter turbo-4, a lithium-ion battery pack mounted under the rear seat, and an electric motor integrated into an 8-speed automatic. The 740e xDrive should have 23 miles of electric-only range, BMW says, when the car does not exceed 75 mph. A Battery Control mode maintains or adds battery charge when driving as a hybrid. The chassis controls that underpin the 7-Series become far more complex this year. A new feature for the air suspension and adaptive dampers uses predictive information to respond to road surfaces. 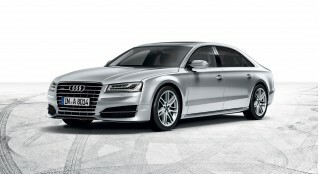 (The 8-speed automatic also uses satellite navigation data for predictive shifting.) 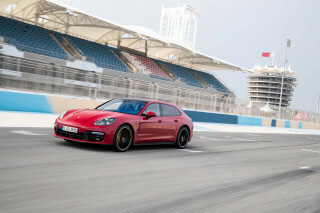 The 7-Series' optional rear-wheel-steering system has been updated so that it can be fitted to all-wheel-drive cars. The 7-Series offers copious interior space, and a low-set dash that gives the visual impression of an airy cabin. Only long-wheelbase cars are sold in the U.S.; they have an inch more rear legroom than the standard model sold in other markets. As always, the 7-Series back seat can be fitted with luxury-liner features such as a fragrance dispenser, ambient lighting, and a panoramic roof. It doesn't end there. The rear seats can be surrounded by heated armrests, can be fitted with ventilation, and can be equipped with a tablet device connected to the Internet via in-car data. Separate from those options, another package gives the car's right-rear passenger a footrest, and moves the front seat forward 3.5 inches so they can use the footrest. A tray table, more storage, and two rear console cupholders finish off that package. On the technology front, the 7-Series isn't just the flagship of the BMW line but also the debut stage for leading-edge technology features that eventually trickle down to the brand's other models. This model is no exception. There's a new wireless charging system for smartphones, and gesture control for iDrive. The head-up display occupies more of the front glass, and night vision and adaptive headlights return with even more capability. BMW is finally caving to finger-driven technology in its cars as well. The 7-Series now has a large 12.3-inch touchscreen. A Bowers &amp; Wilkins surround sound system, with 1,400 watts of power and 16 speakers, takes care of the aural needs of passengers. According to the the EPA, the 2016 BMW 740i is rated at 21 mpg city, 29 highway, 24 combined. The 750i was rated 17/25/20 mpg; adding all-wheel drive drops those numbers by roughly one mpg across the board. 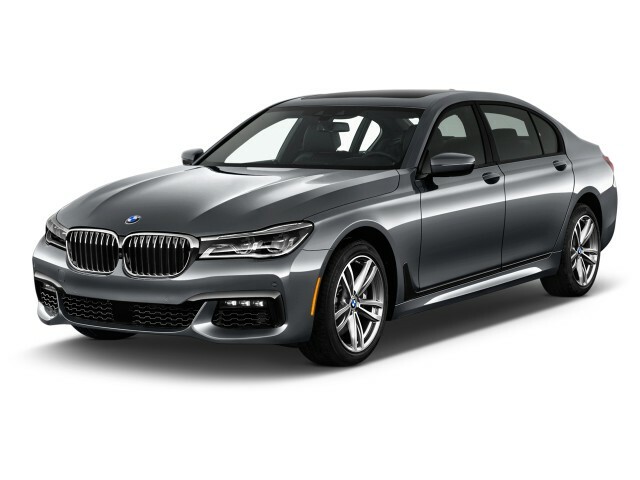 Only offered in the long-wheelbase body style, the 2016 BMW 7-Series is substantial but athletic, with the boldest twin kidney grille yet. BMW keeps the exterior design of the 7-Series remarkably clean, and it builds on the classic sport-sedan proportions that the brand has re-established with the current 3-Series and 5-Series models. Just as we've seen in BMW's recently renewed utility vehicles, there's a larger, taller version of the brand's twin-kidney grille. In fact, it's the largest version of this grille yet. BMW calls it the Active Kidney Grille because it manages airflow for efficiency. Along the sides, a beautifully sculpted belt line crease rises from the hood and continues, in subtle fashion, all the way to the rear lamps and a chrome accent bar across the rear. A chiseled piece of brightwork starts behind the front wheelwells, where it incorporates an air breather, and continues along the lower side of the vehicle, taking visual weight out of the car's profile. Smooth, powerful, and agile, the 7-Series is a sporty take on the modern luxury sedan. BMW's new 7-Series architecture blends carbon-reinforced plastic, aluminum, and steel to help the car gain strength and lose weight. The suspension has trimmed down, the doors and trunk lid are stamped in aluminum, and BMW bonds some pieces together with glue, all in the name of cutting weight. All told, the new 7-Series is 190 pounds lighter than the car it replaces. The lighter structure teams with 50/50 weight balance front/rear and a host of suspension technologies to provide a comfortable but nimble driving experience. The control-arm front and five-link rear suspension are augmented by a four-corner air suspension and electronically controlled dampers. 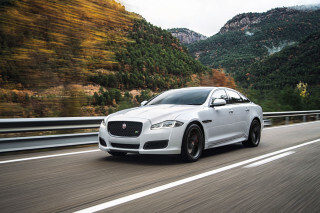 The air suspension can raise the car about an inch to better deal with steep driveways or bumpy roads and lower it about a half inch to improve aerodynamics on the highway. The dampers can be set for a firmer or more comfortable ride. The new 7-Series is also available with Dynamic Drive active roll bars, which are part of the new Active Comfort Drive with Road Preview system. This system uses the air suspension, dampers, and active roll bars to adjust the ride quality automatically. It interprets data from driver inputs and uses information from the navigation system to read the road ahead to determine if the various settings should be aimed at sportiness or comfort. Buyers can also opt for BMW's revised Integral Active Steering, which features up to three degrees of rear steering angle and a new variable ratio steering rack. BMW's Driving Dynamics Control system can adjust the dampers, throttle, steering, and transmission through the range of Comfort +, Comfort, and Sport settings. Dial it to Sport mode, and the car's active roll bars help it stay flat, wrestling its 4,600-pound curb weight through corners as if it were a lighter, smaller car. The same mode turns up the wick on throttle and transmission sensitivity, and adds some weight to the steering and stiffness to the dampers, to filter in some road feel without making the ride too firm. Comfort dials down the engine and steering responses while smoothing out ride; Comfort+ lets the dampers loose to sail over bumps. Ride quality is stellar in those Comfort modes, but sharp bumps pound through on 7-Series cars with big wheels and low-profile tires. The steering, is pleasantly quick if light. Some drivers might think it's too quick and direct for a car this size; it does require many small corrections in highway driving. 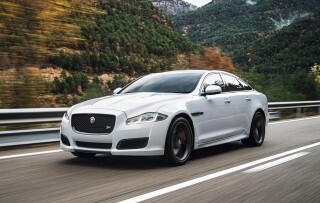 The 4.4-liter twin-turbo V-8 and 8-speed automatic are silky smooth, and deliver its 445 hp with almost no fuss. BMW says the 750i can hit a 4.3-second 0-to-60-mph sprint. That seems a bit of a stretch to us, but no 750i owner will ever want for power. We haven't driven the 740i yet, but we that powertrain should offer plenty of power for most drivers as well. BMW uses only the highest quality materials in a roomy and isolated cabin. The cabin of the 2016 BMW 7-Series is one fine place to spend some time. The wood, leather, and metal materials are of the highest quality. Not only that, but BMW has found a new set of details on which to focus. It lights the interior with ambient lighting, for a sense of occasion when the door opens. Some dash buttons have a thin metal layer for the cool-touch effect held dear by old-car enthusiasts. BMW applies wood to the base of each C-pillar, and fits mood lights to the B-pillars. Other luxuriant touches include an available Alcantara headliner, diamond-quilted leather, and dozens of personalized options sold through BMW's Individual program. The next step? A luxury rear-seat package that heats the front and back-seat armrests, and ventilates the back seats while it massages those lucky passengers. A lounge option fits a footrest to the right rear seat and moves the right front seat forward by 3.5 inches-to make the room for that rear-seat footrest. It also gets an airline-style tray table and a twin-10-inch-screen entertainment system. With both of these packages, BMW bundles a 7-inch tablet that lets back-seat passengers take charge of the climate control, navigation, infotainment, and seat adjustments. The tablet can also surf the web by connecting to the car's native data service, and it works outside the car, too. BMW's iDrive has new talents for the new year. A touchscreen appears for the first time, and it's big - 12.3 inches across. The knob controller now accepts handwritten input on its touch-sensitive surface. It can also accept gesture-driven inputs for functions like accepting phone calls, adjusting volume, and looking at a 360-degree illustration of the vehicle. The gesture system works well enough, but it doesn't always respond the first time, and gestures must be made directly above the iDrive controller for the car to recognize them. Crash test ratings aren't available yet, but the 2016 BMW 7-Series offers almost every safety feature known to man. The 2016 BMW 7-Series hasn't yet been rated by federal agencies nor the IIHS. Standard safety equipment includes knee airbags and rear-seat side airbags, as well as front-seat active head restraints. BMW fits a standard rearview camera and standard parking sensors, so drivers won't commit unforced errors in parking lots. Attention Assist monitors the driver for nodding heads, and displays a coffee cup if it detects an unsafe level of fatigue. New adaptive headlamps are also standard, and they now take into account speed, steering angle and yaw. The Driver Assistance Plus Package adds surround-view cameras and a forward collision warning system with automatic emergency braking. The surround-view cameras can now show not only a top view but also a 3-D View mode, as well as a Panorama View showing side traffic in front and behind the vehicle. The Driver Assistance Plus Package II goes even further, with adaptive cruise control and active lane-keep assist, Side Collision Avoidance, and Traffic Jam Assistant. The adaptive cruise control and Traffic Jam Assistant allow for semi-autonomous driving, following cars ahead and providing steering assistance to keep the car in its lane. Expensive but well equipped, the 7-Series serves as a showcase for the latest technology. Completely redesigned for 2016, the new 7-Series is the sixth generation of BMW's largest and most expensive car. It returns in just three models at launch: the inline-6-powered 740i and the V-8-motivated 750i and 750i xDrive, the latter with all-wheel drive. A 740i xDrive and a 740e plug-in hybrid will arrive soon, but the V-12 760i and diesel 740d will not, and neither will the short wheelbase body style. All 2016 7-Series have a long wheelbase that adds one inch of rear leg room over the shorter wheelbase models. Pricing is up about $3,000 model for model and more than $7,000 overall due to the lack of a short wheelbase body style. 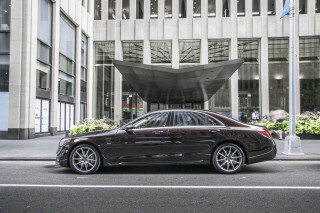 With prices starting about $82,000, all 7-Series models are well-equipped. Standard features of the 740i include Dakota leather upholstery, four-zone automatic climate control, a 12.3-inch center touchscreen, a navigation system, a rear pass-through, self-leveling air suspension, electrically controlled dampers, BMW's new Gesture Control system, Bluetooth, a USB port, wireless phone charging, ambient lighting, adaptive LED headlights, soft-close doors, Comfort Access hands-free opening and closing trunk, and a panoramic sunroof. An Interior Design Package adds an Alcantara headliner, deep-pile rear floormats, and additional wood trim. The M Sport Package comes with an aerodynamic body kit, 19- or 20-inch M light-alloy wheels, larger brakes, illuminated door sill plates, and accents in either light or dark chrome. Also available is BMW's new Display Key. Instead of the usual key fob, buyers get a bit larger fob that has a 2.2-inch touchscreen. The screen allows drivers to monitor trip computer information like fuel level and estimated range, plus service requirements and the vehicle lock status. It has a range of about 1,000 feet and it can be recharged in the center console. With willing power comes mediocre fuel economy. 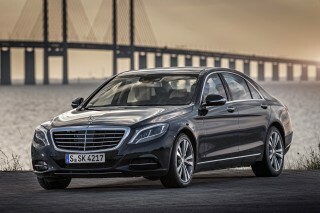 That will pick up with the release of the 740e plug-in hybrid. According to the EPA, the 2016 BMW 740i is rated at 21 mpg city, 29 highway, 24 combined. The 750i is rated 17/25/20 mpg; adding all-wheel drive drops those numbers by roughly one mpg across the board. 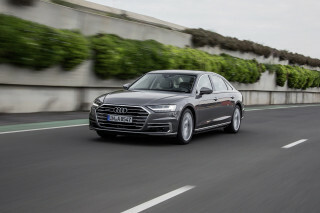 The forthcoming 740e xDrive plug-in hybrid will have considerably better ratings. It will use a 2.0-liter turbocharged inline-4 engine, an electric-drive unit integrated within the 8-speed automatic transmission, and a lithium-ion battery pack mounted under the rear seat. BMW says it will be able to go an estimated 23 miles on electricity alone, though that mode is limited to 75 mph. It will also have a Battery Control mode to control battery charge and discharge, running in hybrid mode on long highway slogs to store up electrons or to run on battery only in urban areas to save on fuel, for instance.